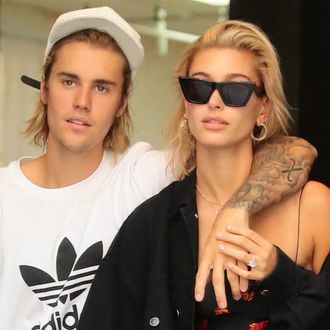 Despite eager reports to the contrary, Hailey Baldwin wants to inform everyone that, no, she hasn’t already married Justin Bieber. But she appreciates your interest, thanks! Per TMZ, Baldwin issued a statement to politely deny the nuptial claims. “I understand where the speculation is coming from,” she explained, “but I’m not married yet!” What we do know for sure, however, is that the duo visited a New York City courtroom last week to apply for a license in the Marriage Bureau, with sources saying during the visit they discussed an imminent trip to Canada. An imminent trip to marry in Canada, maybe?